I run to escape the ordinary. When I run I feel free. When I run, nothing else but the air in my lungs, the ground beneath my feet and the sounds around me matter. 1. 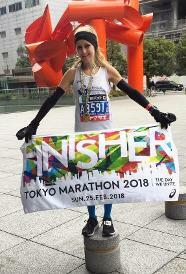 Going sub-3 at the Tokyo marathon 2018. After many months of training, the feeling of crossing the finishing line and seeing the number “2” on the clock was incredible. 2. 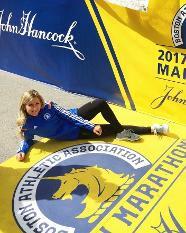 Crossing the finish line at my first Boston marathon. The energy of the crowd, the history of the course and the respect of the locals; you can not put this feeling into words. Hitting my own goals and setting PR’s is awesome, but helping, encouraging and supporting others in obtaining their goals and PR’s is an awesome feeling. I ran with my first pace team at the Chicago marathon and the pace leader helped me hit my goal (at the time was 3:05:00). After the love and support I got from this pace group, I knew I wanted to do the same for other runners. I was pacing a half marathon in Georgia on Independence Day on a 90 degree morning and crossed the finish line with an Iraq War veteran who was running his first half marathon. Being able to share the joy and the tears and hear this man’s stories of true strength was second to none. Pacing is not only able aiding others to hit pace goals; it is about bringing them out of those deep dark places when running gets tough. Pacing is about sharing laughs and tears with runners over miles and miles of racing. A marathon does not start until the last 10k. Do not go out too fast...it is a marathon, not a sprint. Do not get wrapped up in the energy and excitement of starting lines… Start out conservatively and finish strong. I have volunteered at wildlife refuges in various parts of Africa and am often found doing fundraisers for several of these refuges.